Piloted by the finest scum of the galaxy since 1980. Welcome to From Concept to Screen, an ongoing article series about the various stages of production that your favorite character, vehicle, creature, location, or scene of the Star Wars saga had to undergo before arriving on the silver screen. The Slave I holds just as much mystery and interesting back stories as its owner Boba Fett. In this installment, we take a peek behind the hull plates and see what made the Slave I fly onto the screen and into our hearts. 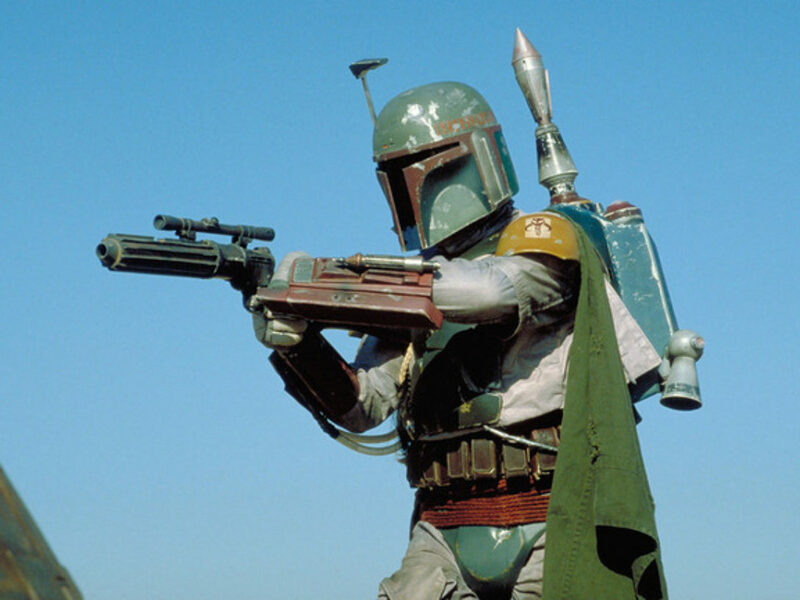 It was not until the second draft for The Empire Strikes Back that the bounty hunters who are after Han Solo are mentioned, including Boba Fett. While the draft does not specify anything on his ship, it does include key scenes like Han being frozen and taken away so that a ship would have to be designed. 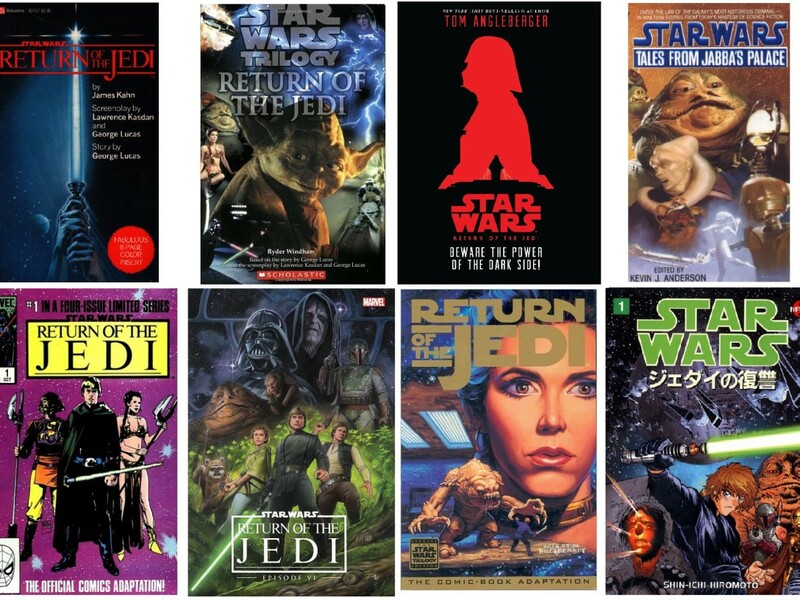 This job, as usual, fell on Ralph McQuarrie and Joe Johnston. While most of the ship would end up being designed by Nilo Rodis-Jamero, McQuarrie originally had the idea of the Ugnaughts working for Fett, and thus designed a much larger cockpit with a row of banks behind the pilot’s chair. With earlier designs by Rodis-Jamero based on a radar dish that the artist had seen one day, the original designs showed a rounder and ball-shaped version of the ship. The later and more elliptical shape came courtesy of a confusing side view, which became the new direction on how to draw the ship. This elliptical shape is most clearly seen when looking at the stern. 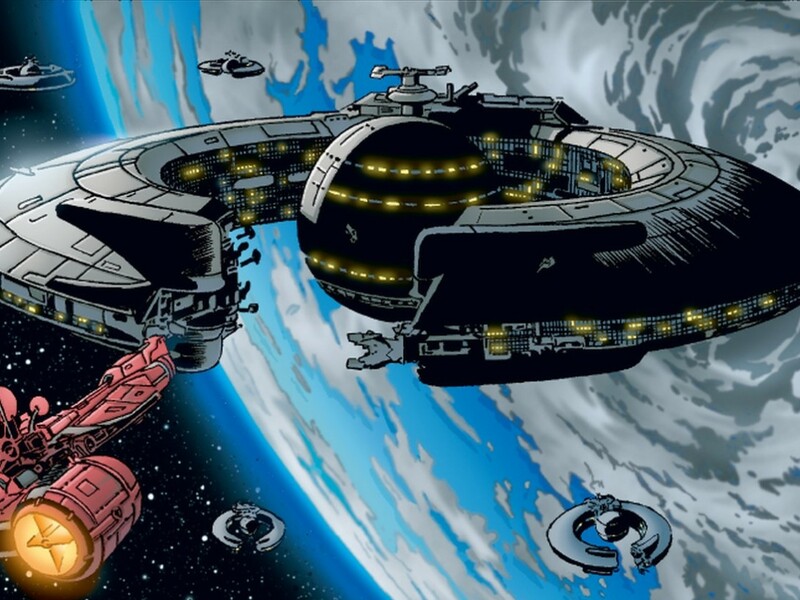 A popular belief is that the shape of the ship was based on the street lights appearing outside the ILM’s Marin County building, but this was revealed to be a mere coincidence by Rodis-Jamero. Besides the street lights, the shape of the Slave I was also jokingly linked to that of an iron. John van Vliet (one of the visual effects supervisors) would draw an image of the ship being used by a woman to iron out some clothes. Working on the model — Ken Ralston preparing the model for stop-motion. Cockpit detail of the model. The team opted for using stop-motion animation to display the Slave I’s support wings. With all the detail the team added to the ship, they expected to see it in the next movie, but ultimately only Boba Fett returned for Return of the Jedi. Ellenshaw working on the East Landing Platform matte painting. With a shooting schedule of 19 days, Jeremy Bulloch (the actor who played Boba Fett) spent much of his time on different sets and not with Slave I. His last day of shooting however, involved the cockpit scene which was built by Ted Ambrose and the second unit. Based on concept art by Rodis-Jamero, the set was partially built with recycled stock control panels from the Star Destroyer set. To make it look it different, the panels were placed upside down and redressed with various switches. During the next two months, ILM would film models of several ships like the twin-pod cloud cars. They would also shoot the scene where the Slave I flies through space debris, and as the ship is seen leaving Cloud City. Doug Chiang’s concept art for Attack of the Clones. Slave I cockpit details by Kurt Kaufman. To create the sound for the Slave I, Ben Burtt did what he always did whenever he had to create a sound for a spaceship: look at how the ship was designed, how it looked like, how fast it would move, and what it could do. For the takeoff sound of the Slave I, Burtt combined a trumpet’s whine with the horn of his own 1971 Dodge Duster while it was on a desert road. 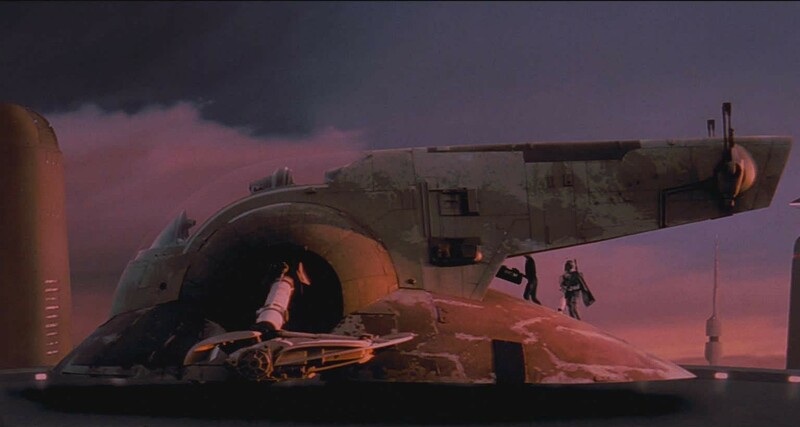 For the Special Edition releases of the original trilogy in 1997, ILM added an additional CGI shot of the Slave I pursuing the Millennium Falcon out of the Star Destroyer’s floating garbage. Added in the early drafts of the script, J’mee Fett (or Jango as we came to know him eventually), was established to be the predecessor to the adult Boba Fett and the stormtroopers that we saw in the original trilogy. While there is little information known on these early scripts, it is safe to assume that there always was some sort of a role for the Slave I planned considering that the film dealt with the origins of Boba. Originally, Jango’s costume was to be white like the clone troopers (just like the original concept design for Boba), but while experimenting with materials they arrived at the silver color they ended up using. The Slave I followed accordingly with a matching color scheme to Jango’s costume and something a lot fresher and newer looking than the colors the ship had while Boba flew it. 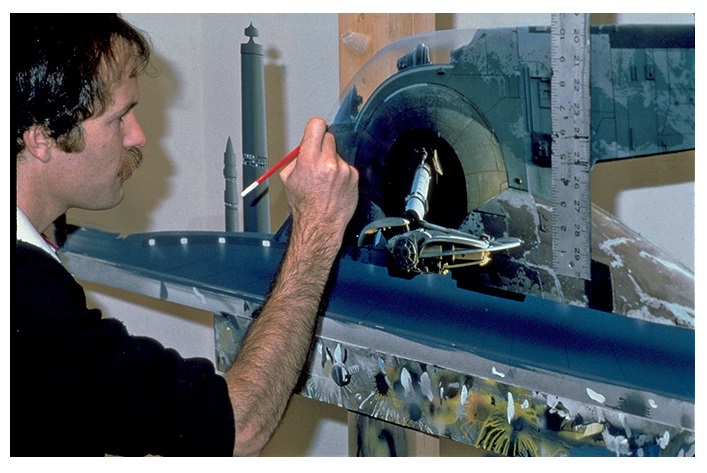 Unlike the models used for The Empire Strikes Back, most of the ship would be created digitally for Attack of the Clones. With the original model of the Slave I on display in the Smithsonian in Washington, the computer modelers from ILM relied on photographic reference. 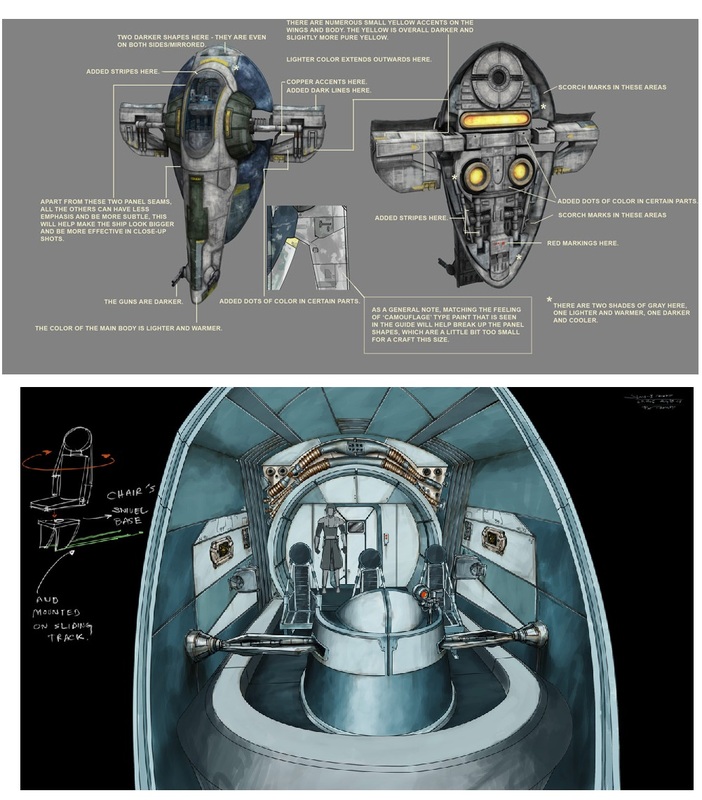 For the few reaction shots that we saw of Jango and Boba flying the ship, the crew again built an actual cockpit based on the concept art of Kurt Kaufman, but this time with more details than the original. The Kamino landing platform was built on stage for the fight scene, and the Slave I was later digitally added. 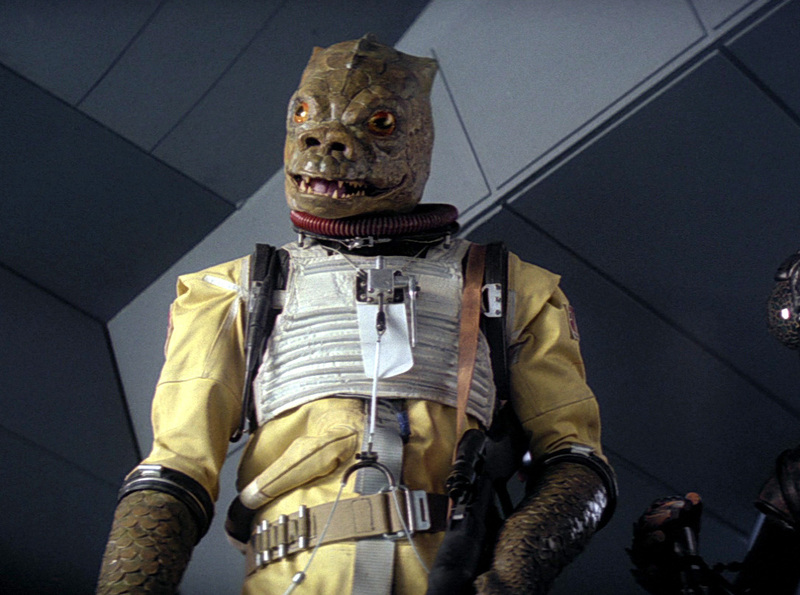 It can be assumed that they used green boxes to create a ramp for Temuera Morrison to walk on when he boarded the ship after the fight scene. This set would also be used for the arrival of Obi-Wan, with a Jedi starfighter prop added to the background. Just like with the fight scene between Jango and Obi-Wan, the people from ILM made an animatic for the chase scene in the asteroid belt between Obi-Wan’s Delta-7 and the Slave I. Morrison would later reveal how helpful it was for him to see the entire scene already played out so he could know exactly where their parts would fit in. The script originally had this chase scene a lot calmer and more like a deadly cat-and-mouse-game, but this was changed after the first cut of the movie for reasons of pacing. With the return of the Slave I in a more action-filled role, the library of sounds had to be expanded from the takeoff sound that was made for The Empire Strikes Back. They included a fly-by effect and sounds for the heat-seeking missiles (which was made realistic by the use of telemetry) and laser cannons of the ship. However, the big sound moment was that of the seismic charges that the Slave I drops to get rid of Obi-Wan Kenobi. The idea behind this weapon and the explosion actually harkened back to what Ben Burtt had tried to create during the production of A New Hope. Burtt experimented a lot with what he called the “space ether explosions,” which were explosions in space that were suppose to sound different than explosions you would hear in the atmosphere of a planet. However, Lucas did not like them and ended up going with the sounds heard in the film. To complete the sound effect, Burtt added a delay which would create an audio black hole before the twang of the sonic weapon. This was inspired by real life lightning that you often see before hearing the thunder. The source of the twang itself remains unknown and is something that Burtt prefers to keep a secret. Because it is such an unprecedented thing to have an absence of sound in a movie, the technicians who evaluated the film said that there was an audio problem with the reel which needed to be fixed. Very early in the process of writing the story for Revenge of the Sith, Lucas toyed with having Boba Fett return, but he quickly scrapped that idea as the movie focused on Anakin’s fall to the dark side. The rumor mill at that time had Boba returning with the Slave I to take revenge on Mace Windu and quite possibly end up killing him, showing just why Darth Vader warned him in The Empire Strikes Back against disintegrating his bounty. 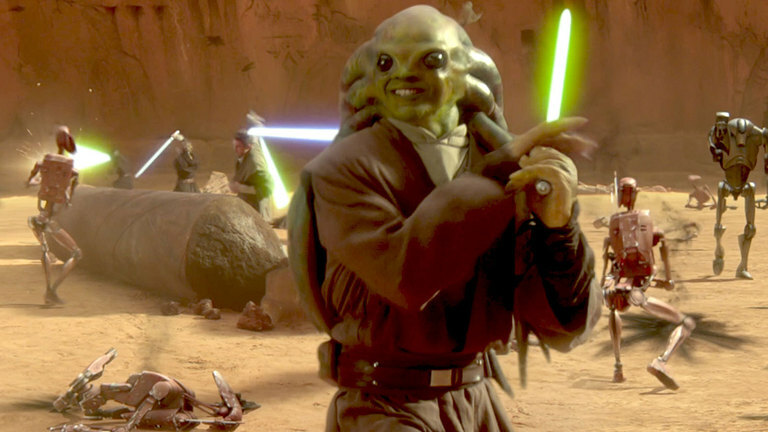 Now we do not quite know what truth lies in these rumors, but it does sound remarkably similar to the The Clone Wars Season Two episodes “Death Trap,” “R2 Come Home,” and “Lethal Trackdown.” In these episodes we would see Boba Fett — with the help of Bossk and Aurra Sing — trying to take out Mace Windu and instead ended up being captured by Mace and Anakin. The most memorable scene in these episodes for the Slave I would be at the end where Ahsoka uses the Force to cling to the outside of the ship while it attempts to flee with Aurra Sing. Ahsoka ended up slicing apart one of the stabilizer wings and the Slave I crashed in a huge explosion. These episodes would expand the ship’s design to include an airlock and featured a more muted version of the blue and white color that Jango had originally painted. A nice detail to the original design of Ralph McQuarrie would also make the ship more like the CG version — with a bigger cockpit, an extra seat, and room for people to stand behind the pilot chair. It would not be until Season Five’s ninth episode “A Necessary Bond,” that we would see what happened to the Slave I after the crash. This episode revealed the ship to have been taken to a secret hangar of Hondo Ohnaka, who rebuilt it and painted it in the familiar olive green and brown colors we came to know. The only difference, besides the paint being fresher and richer in color, was the addition of the Weequay pirate’s personal logo. The concept art for this episode, as seen in the episode guide on StarWars.com, would show the four stages of color the Slave I would go through in its career. Whether the ship is blue and white or olive green and brown, there is no question about the cool factor that the Slave I had and we can’t wait to see it turn up again. 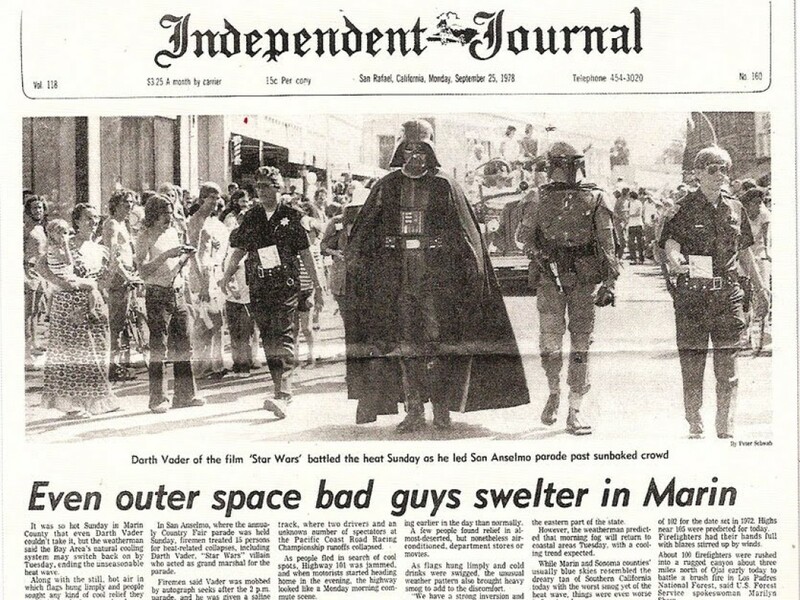 Who knows, we may someday get to see just how Boba Fett got the ship back from Hondo! For more images featuring the Slave I, please visit our official Tumblr and Instagram in which the ship is the spotlight of this week! Sources: The Making of The Empire Strikes Back, The Sounds of Star Wars, Sculpting a Galaxy, and Star Wars Mythmaking: Behind The Scenes of Aotc. 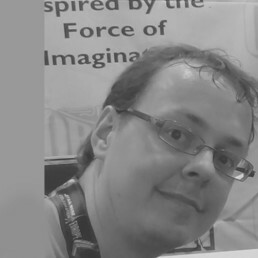 Sander de Lange (Exar Xan) from the Netherlands, worked on the “Rogues Gallery” feature in Star Wars Insider and wrote the backstory for Niai Fieso through “What’s the Story?” He is an editor for TeeKay-421 — the Belgian Star Wars Fanclub — and is an administrator for the Star Wars Sourcebooks page on Facebook. Being born in Deventer, a city used to shoot the world-famous movie A Bridge Too Far, he’s always had a passion for shooting locations and tourism, in which he hopes to find a job.